Jacksonville has 22 miles of white-sandy, spacious and exciting beaches. All you have to do is decided which Beach to sink your toes into, Jacksonville Beach, Neptune Beach or Atlantic Beach. Work on your tan or get active, take surfing or kiteboarding lessons, rent kayaks and paddleboards, fish at Jacksonville Beach and haul in a big one from the surf! Less than three miles from the Beaches you will find the Intracoastal Waterway, 40 miles of peaceful canals and natural inlets where visitors can take an airboat ride and come face to face with the local wildlife, including dolphins, manatees and hundreds of bird species. In the heart of Downtown Jacksonville, the St. Johns River takes the spotlight. Walk the three-mile Riverwalk alongside of The Jacksonville Landing and visit the Riverside Arts Market, all while enjoying breathtaking views of our unique city skyline on the riverfront. 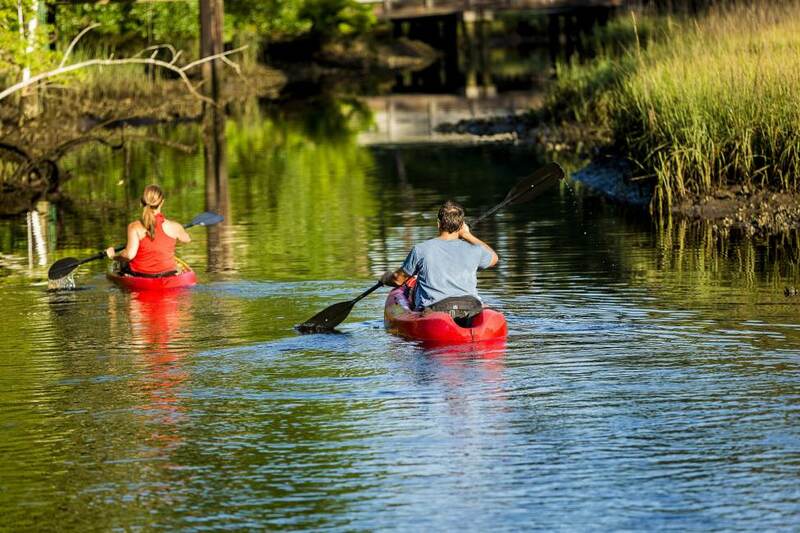 Explore Hanna Park and camp, bike or hike, there is also a 60-acre freshwater lake just feet from the ocean for kayaking and canoeing. Not to mention "The Poles" are a premier surfing spot in Jacksonville. Huguenot Memorial Park offers pristine white sandy beaches, waterfront campsites and a boat launch area. Jax Fact: Huguenot is the only beach in Jacksonville where you are able to drive your vehicle on it- just watch out for the changing tides! Other amazing beaches gems in Jacksonville are Little Talbot Island and Big Talbot Island State Parks, with camping sites, guided kayak tours, hiking trails and unique areas like Boneyard Beach and its salt-washed skeletons of live oaks and cedar trees on shore. tours with nature activities, tidepool exploring and scavenger hunts to get to know the local critters. Freshwater, saltwater or a little bit of both we have you covered for fishing in our Water Wonderland! For a fishing trip of your own you can contact some of our local fishermen. Better yet, check our local expert Captain Dave Sipler's blog. Grab your mask, fins and pick up a tank while you're here! North Florida offer more reefs, more marine life and less people than compared to South Florida. One of the largest artificial reefs in the World is off our coast between Jacksonville and St. Augustine. What can you find below the surface in Jax, click here to find out or contact a charter company. While in Jacksonville, families must head to Adventure Landing. During the spring and summer, cool off at Shipwreck Island Waterpark with four major water slides daring guests to test their adventurous side. Think you can navigate our waters? Trailer your boat, Jacksonville has over 50 public boat ramps ready for your next launch. Don't have a boat, don't sweat it you can rent one from Boat Florida Rentals. They offer a variety of vessels from waverunners to 7-Day Boat House rentals, we suggestion making a reservation in advance! "The longest sailboat race in the world" sails through Northeast Florida each spring, the Mug Race Sailing Regatta. Since 1953, sailors have tried the challenge of Mug Racing in boats ranging from sailing canoes and Sunfish to high-tech catamarans. The 38-mile race takes place the first Saturday in May each year, beginning along the waterfront in Palatka, a small town about an hour's drive south of Jacksonville, and ends in Orange Park. Get from one body of water to another, travel across the St. Johns River on the historic St. Johns River Ferry--a car and passenger ferry. This legendary, unique transportation connects Highway A1A to Mayport Village and Fort George Island. Check out their new app for the latest departure times.